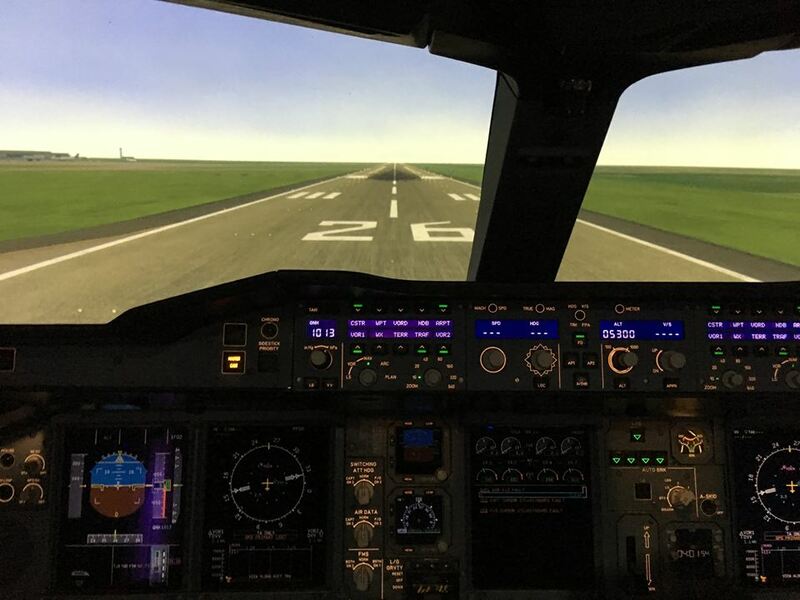 As an aviation geek and private pilot, (VFR and some IFR but haven’t flown in a long time), one item on my bucket list has been to fly in a real airline flight simulator, (as close to real piloting as you can get), since I’ve deemed flying a real airliner unattainable. 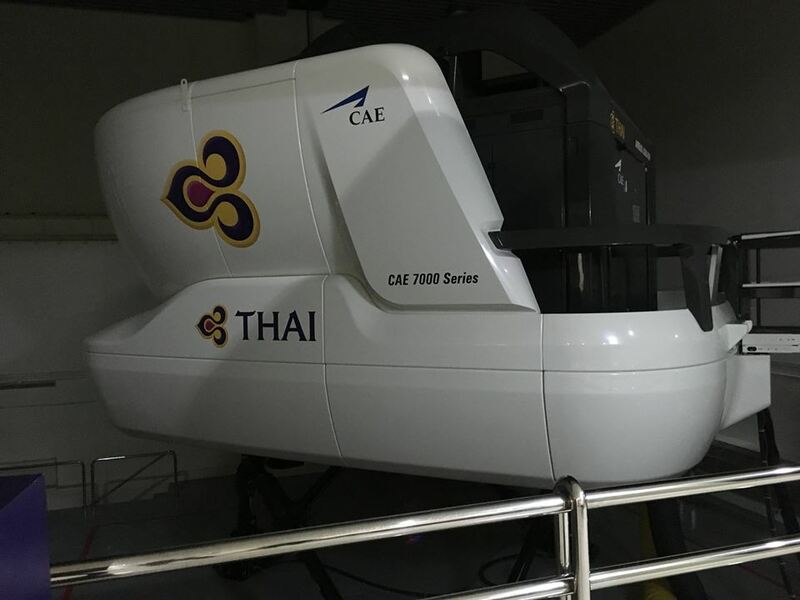 Thai Airways has a program in which aviation enthusiasts, hobby pilots, kids, and big kids, can spend time in a simulator with a real pilot. (United offered this long ago). 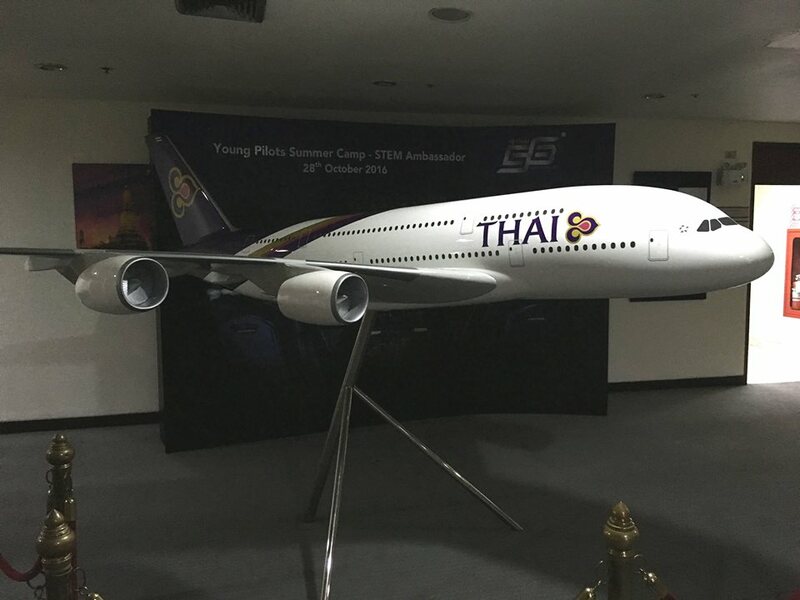 Before arriving Thailand a few weeks ago I set up an appointment in Bangkok for some time piloting the Airbus A380. 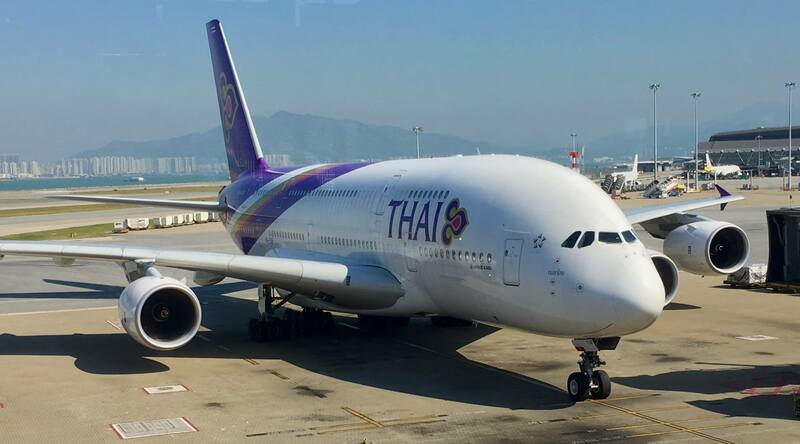 I was scheduled to fly the real one for the first time from Bangkok to Hong Kong, (I snapped a nice picture of it arriving Hong Hong the next day), but changed my flight after my visit was confirmed. 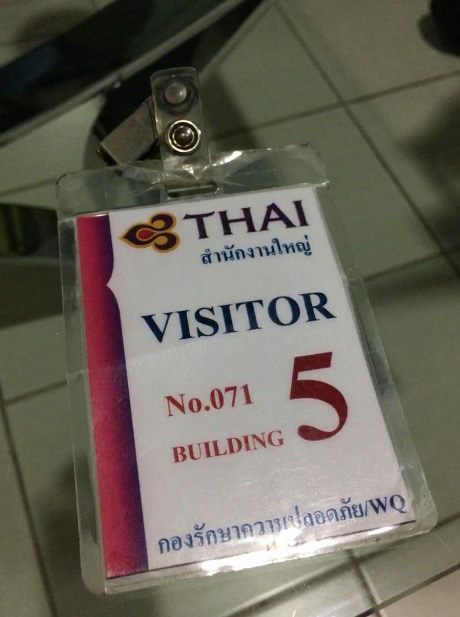 I Ubered up to the Thai Airways headquarters. 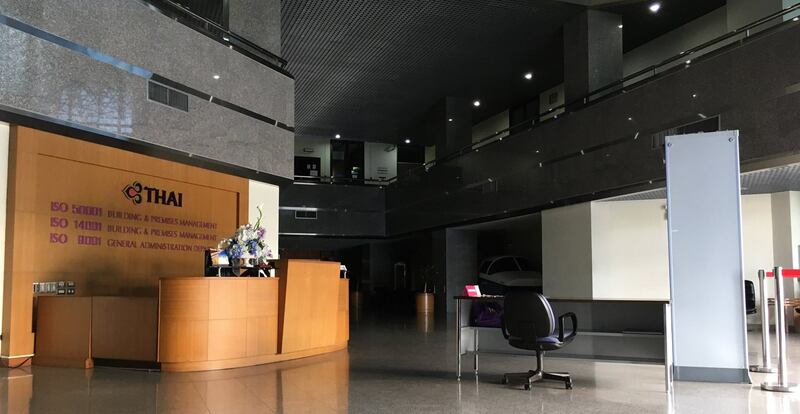 It was a weekend so a little quiet except for the security and maintenance staff. 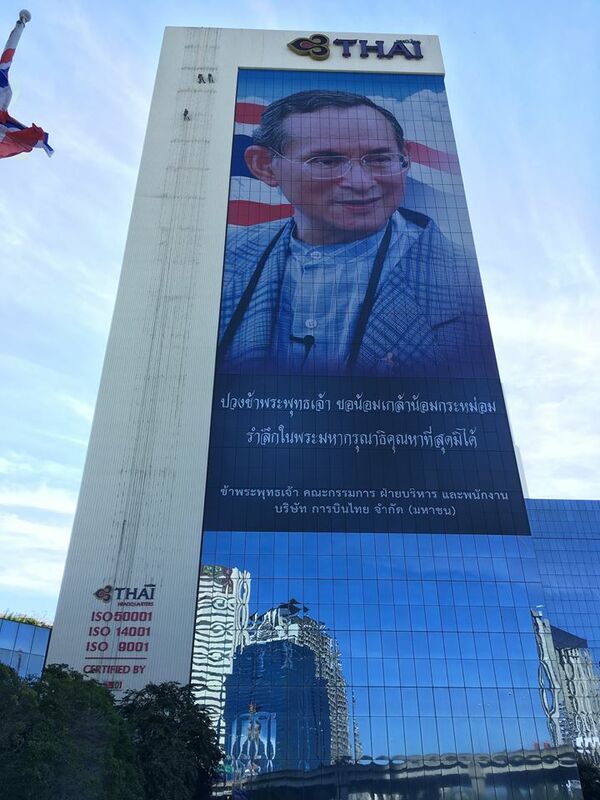 The building has a large portrait of the Thai King, a beloved figure who recently passed away. His portrait is currently adorns many public places as a memorial. 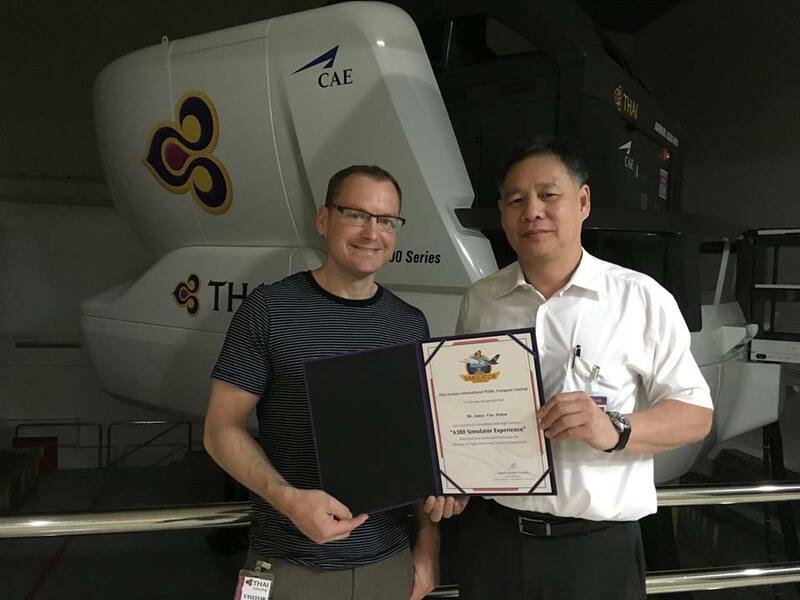 I met with Captain C. Choke, where we did a basic briefing. 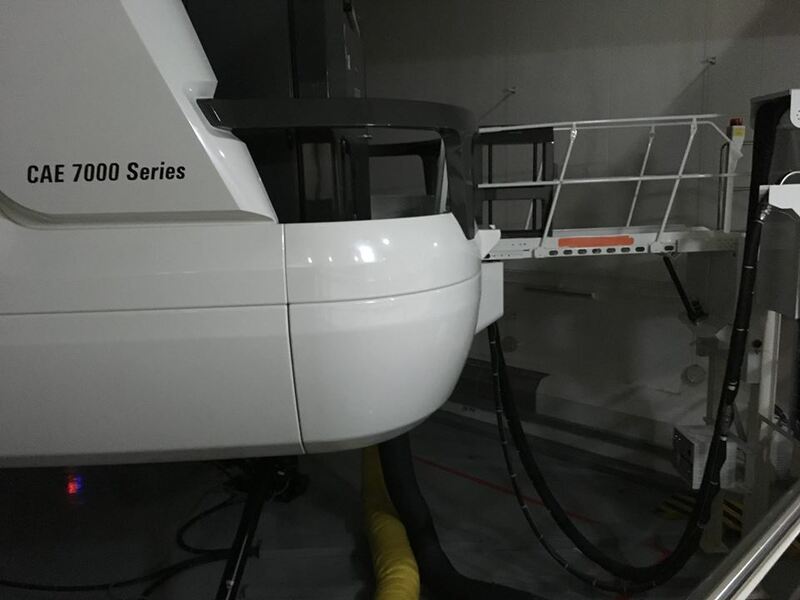 We visited the simulator control room where a few people were monitoring the active ones, then saw some of them up close, from the 737 up to the A380. In my emails I let them know my basic aviation experience and familiarity with standard terms, procedures, airspace, etc. 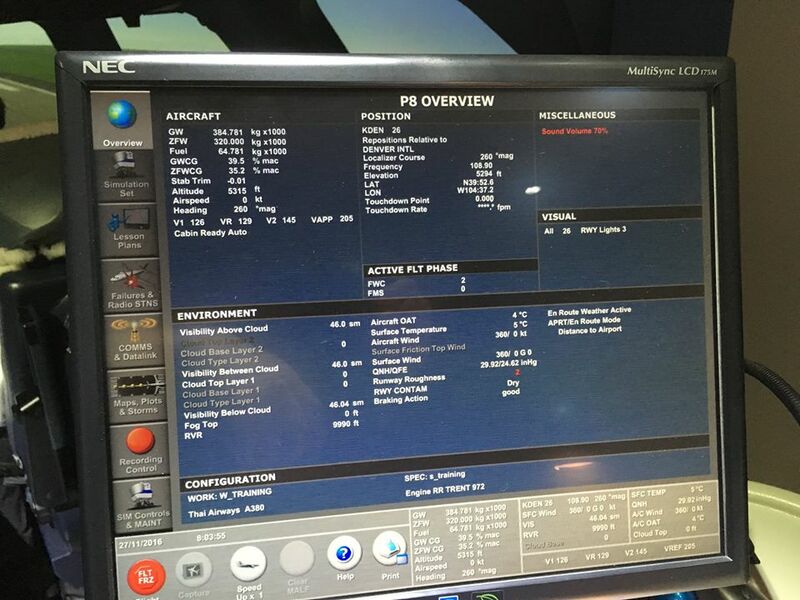 I did learn a bit about the technology, such as their maps: They use LIDO, a Lufthansa company, rather than Jeppesen. 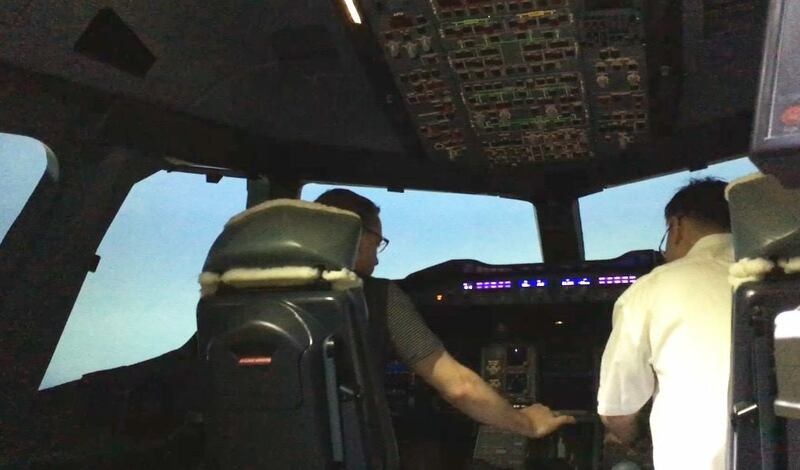 Sitting down in the left seat was very overwhelming, and most of the time was spent hand flying takeoffs, approaches, and landings—focusing on headings, descents, stable approaches and transitions, which was challenging enough. 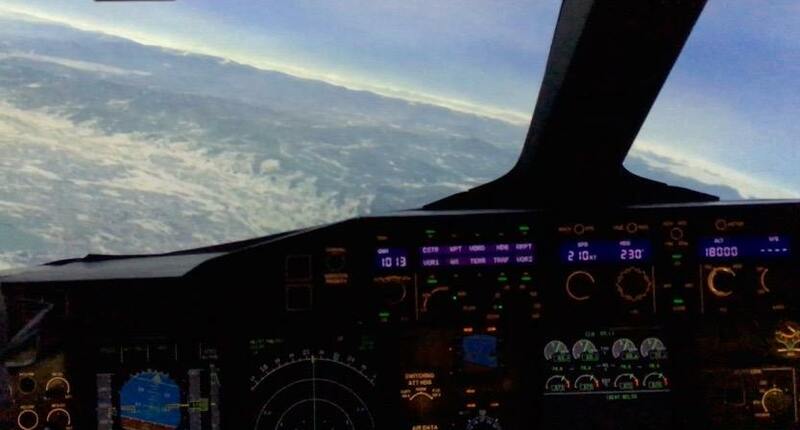 In my emails I requested to fly some procedures I was familiar with, mainly the southwest departure out of Denver and arrivals into LAX, both areas I’ve flown VFR, and as a passenger countless times. (I forgot that DEN 25 is actually the takeoff runway generally used for western departures, not 26.) The Captain suggested visiting New York City, so we toured the Manhattan skyline and landed at JFK’s 13R. 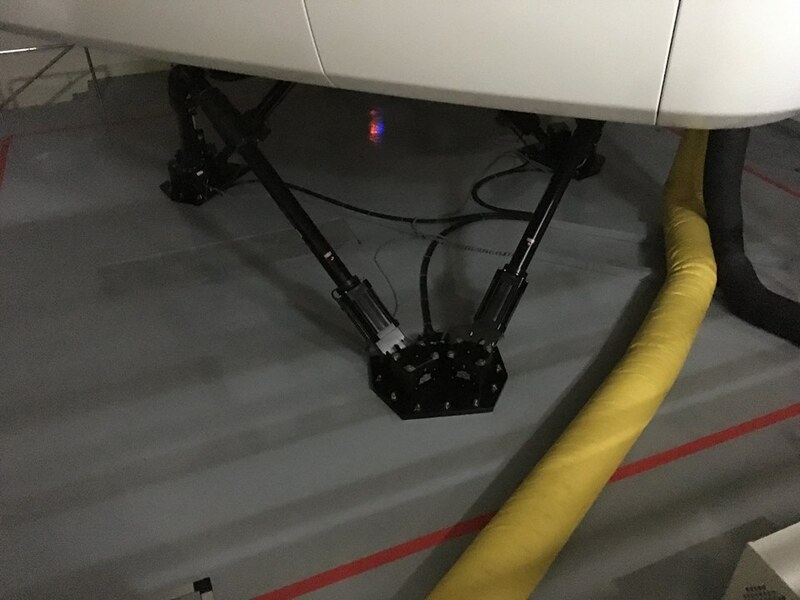 Since the two joystick style controls on the Airbus are differentiated, one safety feature is an assertive voice that says “Dual Input” to alert you if the other person is using them. (Of course this was triggered when my instructor helped with corrections.) I looked up if this was added after the Air France 447 accident, but I read that’s it’s been an option for quite some time. The topography and major cities are incredibly accurate, as of course is the feeling of motion. Flying west out of Denver I showed him some landmarks in the city, along with Pikes Peak and Mt. Evans as we headed southwest over the mountains. 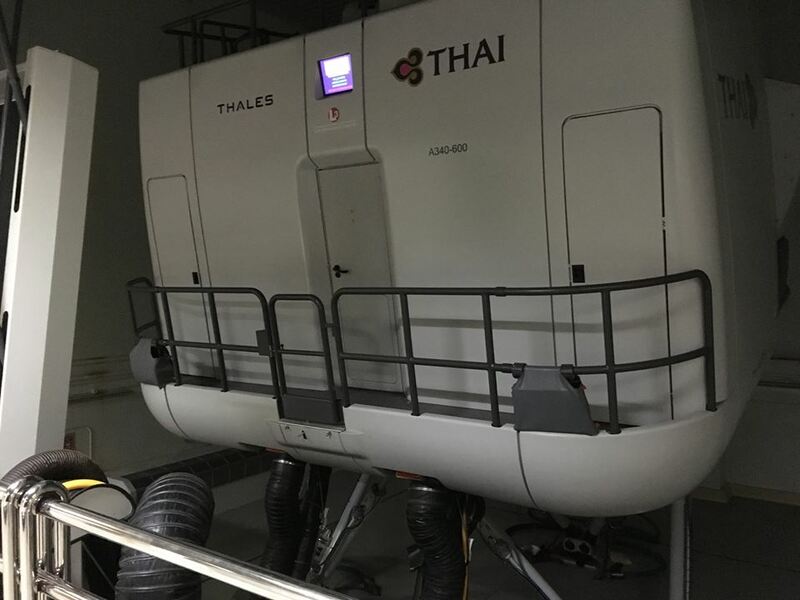 The simulator department’s office manager (and wife of another Captain) was kind enough to record some video. On the final landing he turned on the snow and wind for an arrival into Denver. 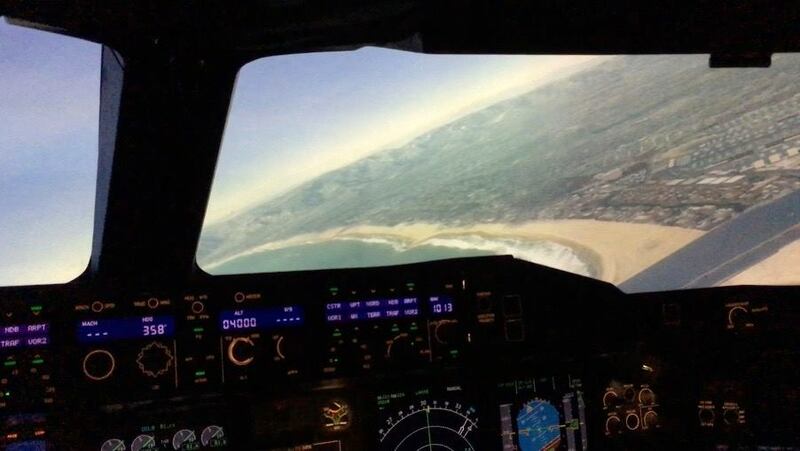 My approach was relatively stable, but I landed hard and frightened my her, our sole passenger. I also received lunch and tea, and a certificate of completion, (which I’m not sure is marketable in any way), but it was a lot of fun, very mentally challenging, and one of the best days of my life.